Ailie Robertson is an interesting young musician, she has a degree in genetics from Cambridge for a start. 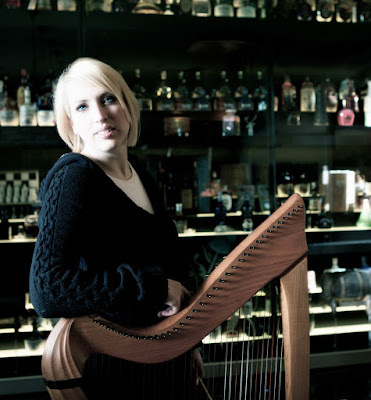 As well as having a career as a harpist playing both classical and folk music, she is starting to develop a name as a composer and her piece Haven for harp and string quartet, which was commissioned by the BBC, has recently been released. So whilst her folk background is reflected in touring and producing albums with her band The Outside Track, she is also studying composition with Michael Finnissy at Trinity Laban Conservatoire of Music & Dance. We met up recently to chat about Haven and the varied strands to her career. I was curious how a musician came to have a degree in genetics. It turns out that though she played a lot of music at school, at the age of 17 she lacked the confidence to say she wanted to be a musician. But whilst at Cambridge she played a lot of music and having finished her degree she gave herself a gap year to try music and simply never went back to genetics. She has spent the last 10 years as a musician, balancing the twin strands of folk and classical, something which dates back to her period at school and at Cambridge when she played tradition Scots music on the clàrsach (the Gaelic wire-strung harp) and classical music on the concert harp. And a significant proportion of her time has been spent with her band, The Outside Track. On reflection she feels that it is better her career as a composer has developed when she is older, and now feels more secure about her chosen career of music. When asked to describe her musical style she calls it cross-over, being neither strictly folk nor strictly classical. The music she writes is mostly notated in classical notation, and the score for Haven has everything the musicians need to know. But Ailie admits that it helps that Donald Grant, the second violin of the Elias String Quartet who recorded Haven, has a folk background too, as the second violin part has the most folk-inflected music. It should be possible for any musicians to play the work, but she feels you need folk-experience to bring more soul to the piece. And she points out that it would be difficult to play Mozart well without first knowing his music. She thinks that her music does not fit a specific genre; it has elements of minimalism, but is too complex. She describes it as exceedingly expressive, and see her music as earth, very connected to people and place. There is something of her traditional Scots background in her style, but she also sees it as as a reaction again new complexity, a style of composition which has no resonance for her. Her family comes from Skye, from the West coast Gaelic tradition with music which is apparently simple yet difficult to notate and transcribe, something that Ailie feels applies to her own music. When recording Haven, Ailie did not play the harp part herself, instead it is played by a good friend, Eleanor Turner along with the Elias String Quartet. Ailie feels it was good to be able to step back and listen to the music. Haven is in fact the third movement of a suite and Ailie hopes that the remaining movements will be recorded at some point. Certainly her career as a composer is starting to take off. She is a member of the Royal Scottish National Orchestra's composers' hub and writing a piece for them, she is writing another piece for Rebecca Tavener's group Canty, and has a commission from Live Music Now. Performing is important to her, she enjoys it, the collaborative aspects and the travelling. As a composer she enjoys collaborating, developing relationships with players. Ideally she would like to spend more time composing but would want to spend time on developing relationships with people playing her music. As a composer she feels it is important that people enjoy playing your music; she knows what it is like to play a piece with which you feel no connection. Michael Finnissy she finds a great inspiration, particularly his healthy attitude to music and institution of music. She likes the fact that in his own career Finissy has not played the game. He has given her the confidence not to care what people think but to write in her own style, to write what she wants to hear. She feels that contemporary music suffers because often composers to not work closely enough with performers. And that festivals constantly see first performances, does not help either. Ailie thinks a composer needs more performances of a work to develop a relationship between the work and the audience. She curated a series called Echoes and Traces with the Scottish choir Cappella Nova, where eight composers (including herself, Sally Beamish and Rory Boyle) were commissioned, and the works were taken on tour getting a total of eight performances. Repeat performances are important because after just one performance, Ailie feels that performers are only just beginning to get to grips with a work. The way Haven has been released is indicative of the way the classical music industry is changing. Ailie comments that as it becomes easier to get music out there, it gets harder to get it heard. 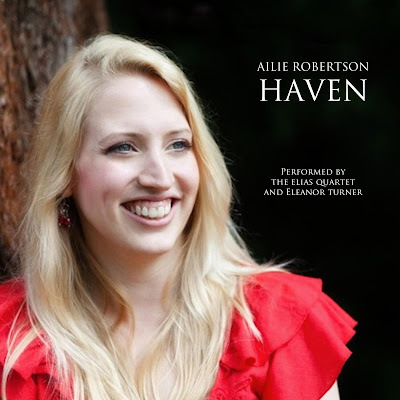 Haven is available from Amazon.co.uk, and is on iTunes and Spotify, and the music is available directly from Ailie.